Twilight Tattoo is The United States Army’s outdoor ceremonial concert that is held throughout the summer in the Washington DC area. It is an hour-long military pageant that features The Old Guard Fife and Drum Corps, The U.S. Army Drill Team, The U.S. Army Blues, and members of The U.S. Army Band Downrange. The performance is free and open to the public. This is a great show for all ages. Location: Fort Myer, Arlington, VA. Summerall Field. Seating is available on a first-come, first served basis. Cannons blast as part of the military salute at Twilight Tattoo. 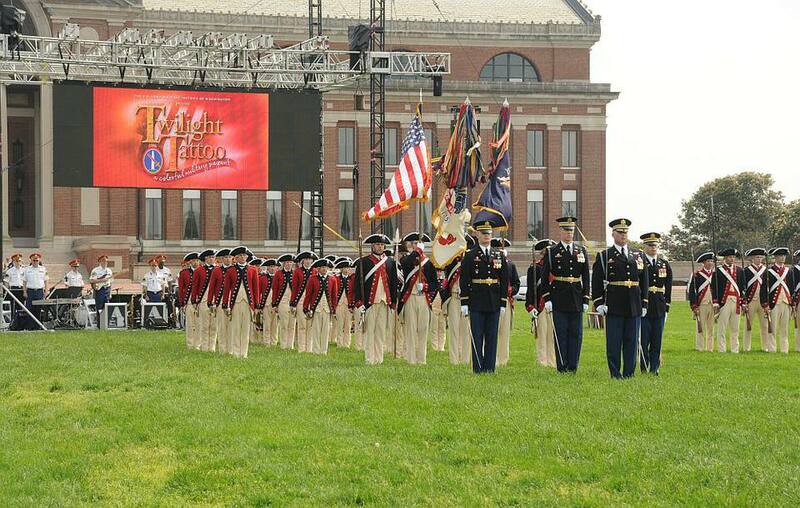 The ceremonial concert includes a variety of patriotic tunes by several U.S. Army bands. The Old Guard Fife and Drum Corps, one of the U.S. Army's premier musical organizations, reminds attendees of the historic significance of our military bands. The Continental Color Guard - 3d U.S. Infantry Regiment (The Old Guard) participates in the ceremonial concert. The uniforms are replicas of the 1784-style infantry uniforms worn by the First American Regiment. The U.S. Army Drill Team is a precision drill platoon that performs breathtaking routines with bayonet-tipped 1903 Springfield rifles. They serve as “good-will ambassadors”, supporting community relations and recruiting efforts for the U.S. Army. Standard U.S. Army Drill Team performances involve 19 Soldiers and are 10 to 15 minutes in length. Old Guard Drummers perform at Twilight Tattoo on the grounds of Fort Myer. Horses are members of the Caisson Platoon of the 3d United States Infantry "The Old Guard" and perform at Twilight Tattoo as part of a ceremonial demonstration. At Twilight Tattoo, soloists from The U.S. Army Voices sing uplifting modern tunes and lead a sing-along with the audience. The Old Guard Fife and Drum Corps, The U.S. Army Drill Team, The U.S. Army Blues, and members of The U.S. Army Band Downrange perform together in the Twilight Tattoo Finale. All About the Inaugural Parade in Washington, D.C.